Two stand-out collections containing Old Master and traditional British works on paper were offered within 24 hours of each other in Oxfordshire. The private collections, unseen on the market for many years, were offered at Holloway’s (20% buyer’s premium) of Banbury on February 27 (in the sale that also featured the £440,000 Old Master sleeper, St John the Evangelist, discussed in ATG No 2232) and Mallams (20% buyer’s premium) in Oxford on February 28. The group sold by the former had come from a long-standing private collection in Wiltshire and comprised British watercolours by the likes of John Martin and Thomas Rowlandson, as well as an oil by Bloomsbury artist Roger Fry. “A lot of these had been acquired from smart London galleries and were fresh to the auction market, and that’s why they did so well,” said Jasper Marsh, senior valuer and auctioneer at Holloway’s. 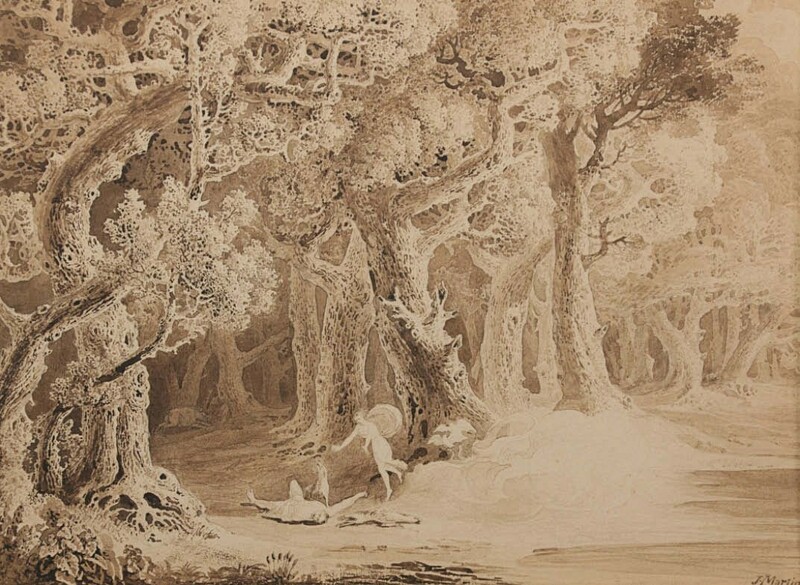 The John Martin (1789-1854), an elaborate early sepia watercolour, took £5800 against a £800-1200 estimate from a probable UK trade buyer. The 8 x 10½in (20 x 27cm) watercolour, c.1819, appears to illustrate the story of Adonis who was wounded by a wild boar while out hunting and bled to death in the arms of his beloved Aphrodite. Martin created a number of images derived from the tales recounted in Ovid’s Metamorphoses early in his career before he went on to produce the vast melodramatic scenes of cataclysmic events for which he is best known. It was recently announced that a £1.5m watercolour by Martin illustrating the Biblical story of Moses has been barred from export in the hope a buyer in the UK can be found (ATG No 2331). 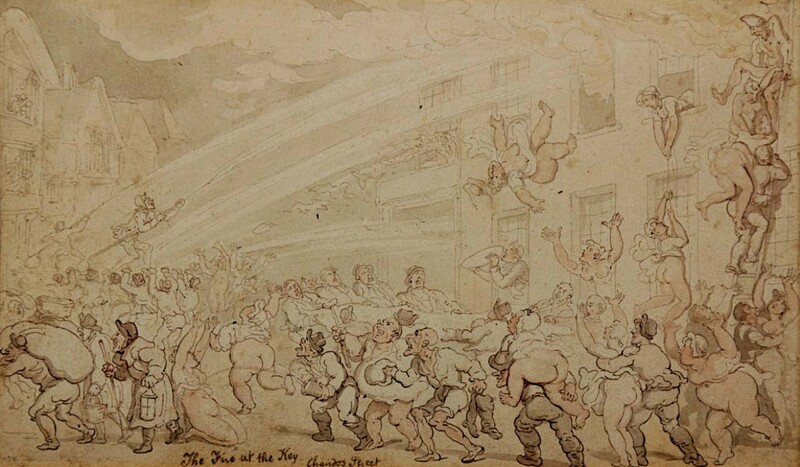 Elsewhere at Holloway’s, an original drawing by the prolific English draughtsmen and caricaturist Thomas Rowlandson (1756-1827) sold for more than six times its guide at £4000. It joins a spate of Rowlandson works that have appeared at auctions recently, including at Mallams. As ATG went to press, Salisbury saleroom Woolley & Wallis was also poised to offer 10 drawings, seven of them from a single-owner collection. The 5½ x 9½in (14 x 24cm) pen, ink and wash at Holloway’s was titled The Fire at The Key, Chandos Street, and depicts the chaos caused by a fire that burned down the The Key Hotel, a notorious bordello in 19th century London, and a stone’s throw from where Rowlandson lived. The drawing is likely to be the same work that sold at Sotheby’s London in 1969 for £150. The Rowlandson entry at Mallams was a 6 x 10in (15 x 24cm) pen, ink and watercolour titled The Afternoon Visit, which took £2400 against a £600-800 estimate. Formerly in the collection of actor and art collector Gilbert Davis (1899-1983), the work was one of 14 well-preserved etchings, drawings and watercolours from the Beale collection that all got away to the tune of £69,300. The group had been on loan to the Ashmolean Museum in Oxford since the 1990s. The works were acquired as birthday and wedding anniversary gifts by Jean and Bill Beale from well-known Bond Street art galleries such as Colnaghi, John Baskett and Richard Day. The result was a variety of drawings dating from the 17th-19th centuries, mainly English watercolours with some Dutch and Italian etchings and drawings also included. 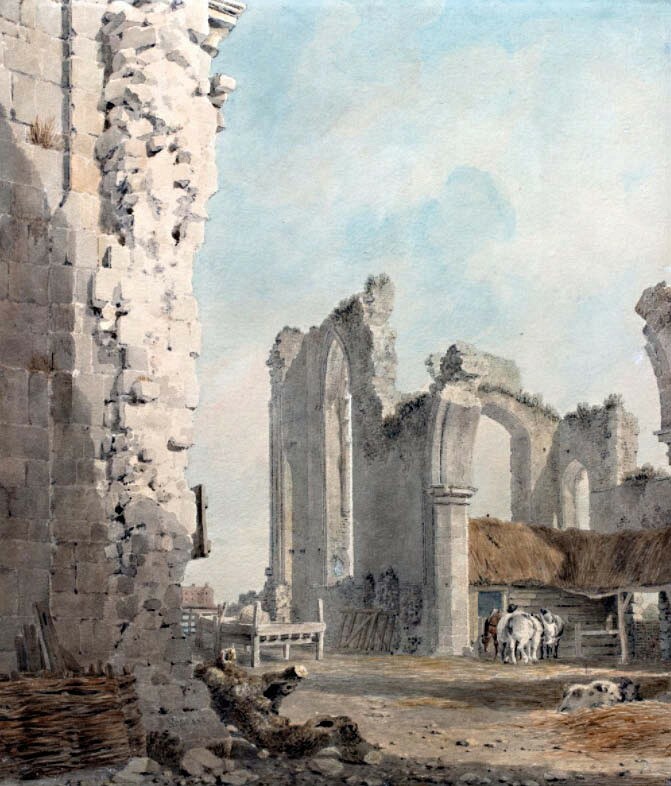 The most eagerly contested of the Mallams group was a 12 x 10in (31 x 26cm) watercolour of the ruins of an unidentified abbey by Michael ‘Angelo’ Rooker (1743-1801). It sold to the trade for nearly 13 times its guide at £15,500. The signed watercolour possibly belongs to a group of works on paper Rooker began in 1788, when he started making autumnal tours in England – chiefly of architectural remains found in Norfolk, Suffolk, Somerset and Warwickshire. “It was a beautiful drawing – not the most fashionable in today’s market you would have thought, but the colours were fantastic, and the combination of the provenance helped it fly,” said Rupert Fogden, director and head of traditional paintings and prints at Mallams. The price is among the highest for a watercolour by the artist at auction. Elsewhere in the Beale collection was one of Edward Lear’s (1812-88) popular continental watercolours. 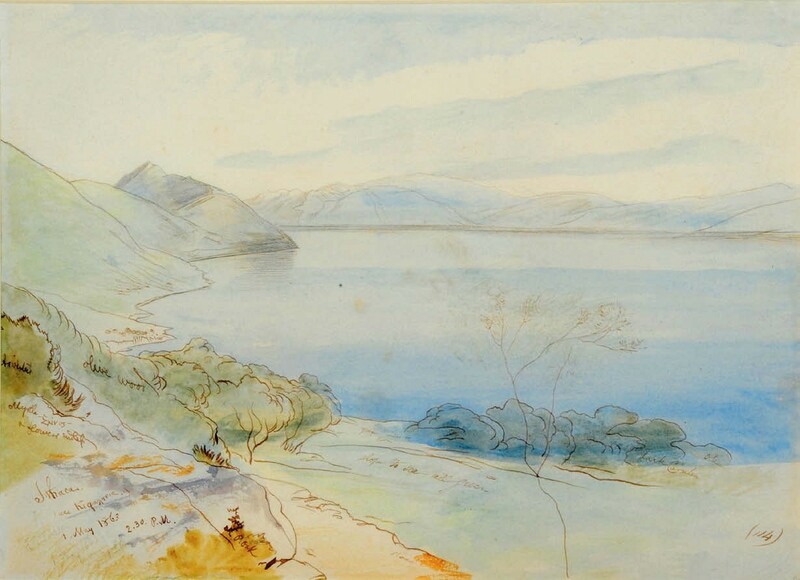 The 13 x 19in (33 x 49cm) pen, ink and watercolour depicts the Greek island of Ithaca and is inscribed with title and dated 1 May 1863 2.30pm. It sold to a phone bidder at £15,000 against a £6000-8000 guide. A number of similar views from Lear’s trip to Ithaca in 1863 have sold on the secondary market, including one at a premium-inclusive £22,500 at Christie’s London last July. The collection also achieved £8000 and £4200 for a pair of Rembrandt van Rijn (1606-69) etchings from 1654 and a top-estimate £5000 for a pen, ink and grey wash drawing of the outskirts of a village by fellow Dutch artist, Anthonie Waterloo (c.1610-90). A more tepid response greeted two Italian Baroque drawings, one attributed to Guido Reni (1575- 1642) and another by Giacinto Gimignani (1611-81), although they still got away quite comfortably, selling for £3000 and £3800 respectively. Overall, Mallams’ 462-lot sale totalled just over £200,000 and was 82% sold by lot.